Since my friend Anjali visited last year and Jan and I got our first lesson on cooking Indian food (see Indian Feast Masala), we were not very good students. Jan made one other dish from Madhur Jaffrey’s Quick & Easy Indian Cooking (Stir-Fried Green Cabbage with Fennel Seeds, or bhuni bahdh gobi) for me to bring to my book club when the food theme for that night was Indian (we were discussing The White Tiger), and then, we made nothing else for a while. 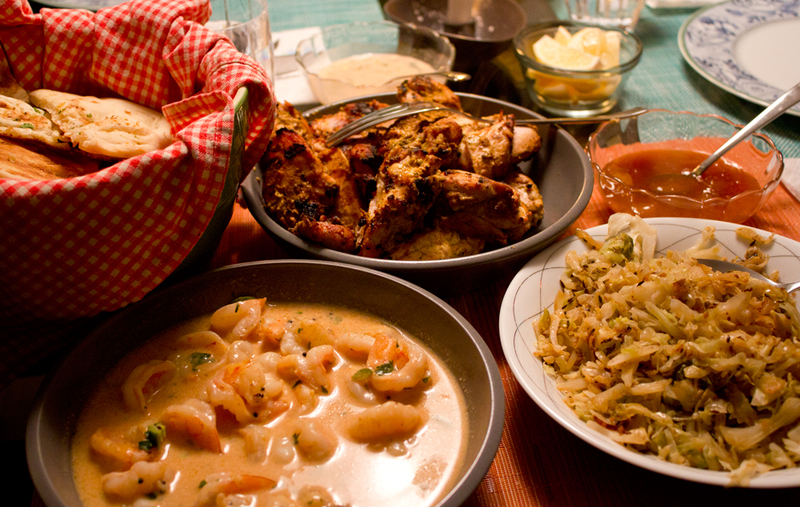 And then, in typical fashion for us, suddenly it was all about Indian food. Though I’ve never been a fan of curry, dinners out and about (at North India Bar and Grill and Malabar Restaurant in Santa Cruz) convinced me that there was so much more than curry to get me excited about Indian. I learned early on that I love naan, and also all the different pickles and chutneys that go along with them. At home, we again made the onion fritters and lentils from our introductory lesson, and began to try some other recipes from the book (thanks again Laura!). An instant hit was the spicy grilled chicken or masalewala murgh, and we had fun sampling that with a few prepared chutneys. One night, the combination of dishes was right on. With the chicken on the grill and the cabbage on the stovetop, we followed the recipe for Indian Mashed Potatoes or mash aloo. We reserved a portion of the mashed potatoes that were prepared according to the recipe (delicious this way), and the other portion was an experiment sparked by something we’d heard about on a cooking show. By searching for more Indian recipes online, we found what we were looking for: mashed potato balls, though the more appropriate name was batata vada, which translates to “potato fritters.” To make them, we rolled ping-pong-ball-sized pieces of mashed potatoes into chickpea flour (besan) that had turmeric added to it. I deep fried the mashed potato balls until the outsides looked golden brown and crispy. Since the mashed potato balls were so delicious, I decided we’d make them for an Indian food themed dinner party we were hosting. And since I was so excited about my newly acquired tool for forming meatballs (looked like scissor handles with ice cream scoops on each end), I thought that would help me make perfectly shaped mashed potato balls. That, however, proved to be a mistake. Because I hadn’t formed the balls by hand, the potatoes were not firmly pushed into shape. When they were deep fried, they quickly began to fall apart. So after all that, what we ended up with was basically just mashed potatoes that had a lot more grease in them than if we’d just left them alone. A few other lessons learned: the marinade for the spicy grilled chicken (following proper food safety and reserving some separately from what is used for marinating the chicken) makes an amazing sauce to dip naan, potatoes, cabbage, and anything else on the plate. Also, Trader Joe’s is a great place to buy naan—they offer several different varieties in their freezer section, and they heat quickly and perfectly in the oven at home. 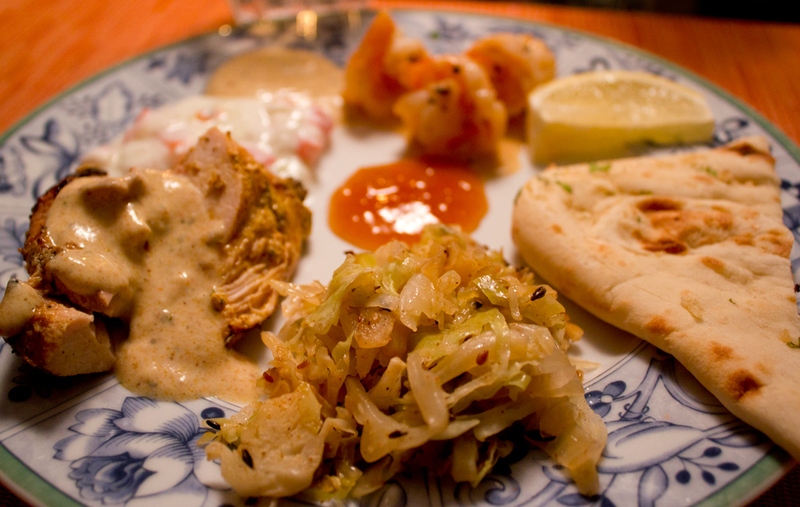 We still have many more lessons to learn in Indian cooking, but I’m enjoying all the taste-testing along the way. So far, the lentils have been the hardest to perfect, but I’ve been polling Indian friends for their tips (so far, the best seems to be soaking them overnight first, then using a slow-cooker or crock pot to prepare). 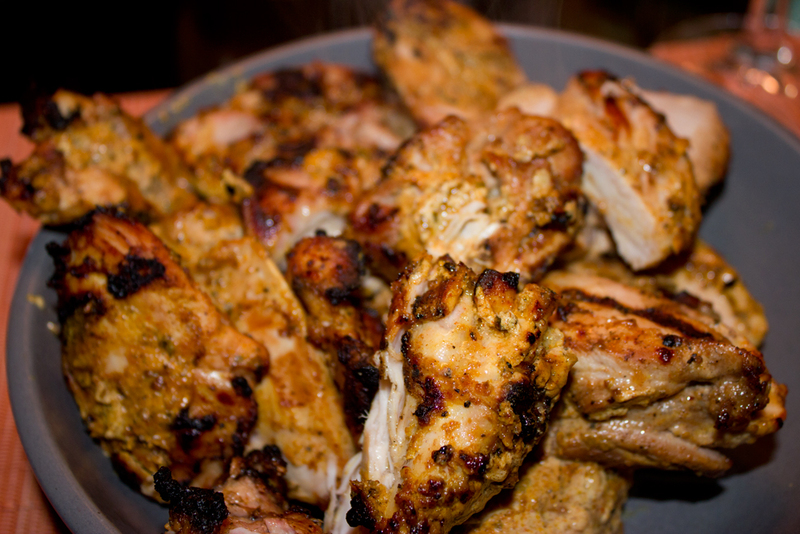 Here’s the recipe for spicy grilled chicken modified from the recipe in Quick & Easy Indian Cooking, and recipes for mashed potatoes and cabbage should follow in the weeks to come. Combine marinade/sauce ingredients in a medium bowl. Divide contents in half; use half to coat chicken and let marinate sit for 2 to 4 hours in refrigerator. Barbecue or grill chicken until done, approximately 10 to 15 min. With the reserved marinade (not what was used with the chicken), add additional ½ cup yogurt and mix thoroughly to serve as a dipping sauce.